Word Fest! is the ULTIMATE crossword game for Word Lovers and anyone who enjoys learning new words! Besides a super-rich set of features, Word Fest! 01 features 30 amazing Sheffer Crossword Puzzles! This game is the first bundle of the Word Fest! series, with many more to come! GREAT content, FUN animations, helpful hints, and personalized experience make this game a MUST-HAVE!! What you get to experience while playing this game depends on how well you do and how many games you have completed. Your experiences are truly unique to you, as no two players will have the same experiences! If you enjoy this game, and you have an iPad, you really don't want to miss "Word Fiesta! 101 for iPad", specially designed for iPad. In addition, you might like to check out our "EZ-30!" series on the iPhone. For news on our future releases, please check out our website, http://www.sunkissedapps.com, or follow us on twitter, http://twitter.com/SunkissedXwords. 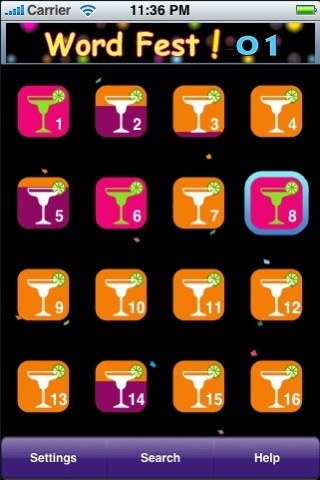 * You have the choice to use either the "margarita" or the "heart" image to represent a puzzle in the Crossword List View. * You can use gestures for navigation and selection. * If you play at the "Regular" skill level, wrong letters are displayed in red. * You can choose the "Pencil" or "Pen" mode, depending on your confidence level. 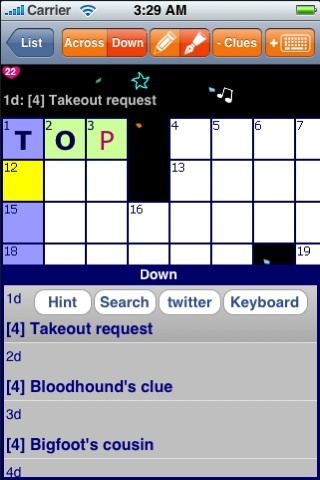 * Clue List lets you see all the clues in Across or Down direction. * You can get hints, send tweets, search the Internet or cheat without leaving the game. * Your work is automatically saved so you will never need to worry. * Configurable settings let you enjoy playing the puzzles at different skill levels and in preferred "zoom" mode. * You can customize your gaming experience by selecting a preferred layout, search engine, or enabling/disabling audio/visual experience. * A User Guide is included for your reference. * We encourage you to get help from your friends or look for an answer on the Internet whenever you are stuck. You will see some unique animations if you try not to use "hint" or "cheat" provided by the game. * When you complete a puzzle without an error, expect an entertaining animation! * The Internet is full of resources. 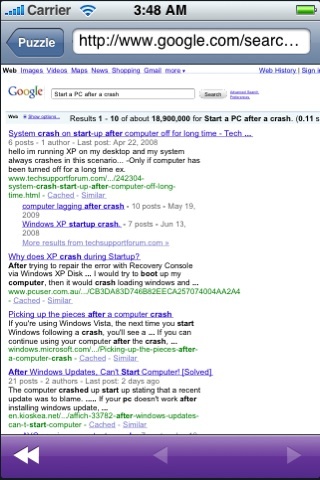 Select a preferred search engine and explore whenever you are stuck. * We encourage you to socialize with your friends. To get outside help, you can send tweets with clues. 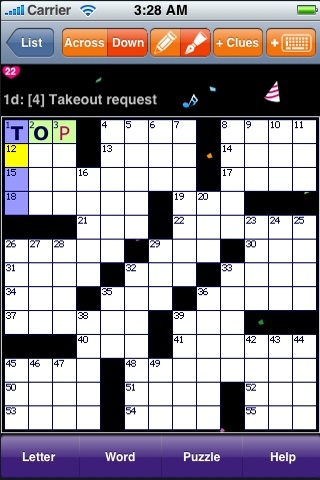 * You can select a cell on the Crossword View and start typing with "Single Tap". * You can zoom in or out on the Puzzle View with "Double Tap". * To move to the previous or next word in the Across direction, Swipe Left or Right. * To move to the previous or next word in the Down direction, Swipe Up or Down. * "Drag" with a finger to move the view when you are in the "Zoom In" view. * Get Hints by tapping "Hint" on the Tool Palette repeatedly. * Select "Cheat" from the Letter/Word Action Sheet if you are totally stuck. * Select "+ Keyboard" to open the keyboard and start typing. * Select "+ Clues" to bring up the Clue List alongside the Puzzle View. * Start with easier clues by popping up the Clue List.